One of the things that new Metro Chair Carrin Patman has been talking about is a regional transportation plan, to get everyone – including cities and counties not currently involved with Metro – to agree on what transit is and how we best go about doing it in a way that serves the greater region’s needs. I am fully on board with this idea, and my purpose today is to discuss a few specific ideas towards that end. My assumption throughout this post is that Metro can and should take a leadership role in this discussion. One can argue for an organization like H-GAC to take the lead, but I see them as more of a facilitator. Metro is the dominant transit provider in the region, and any meaningful regional plan for transit necessarily goes through them. They need to be the driving force to make things happen. To me, the first principle in a regional transit plan is that it should be possible for anyone in the region – and I am talking about the ten-county greater Houston region that H-GAC covers – to plan and execute a trip on any transit line, from any point of origin and to any destination – from a single app or website. That includes mapping out the trip, estimating total trip time by the published schedules, and paying for the fare. It shouldn’t matter which agency or agencies are involved – any transfers, whether inter- or intra-agency, should be seamless. All you as the transit customer need to do is say that you want to start here and end there, and the rest is made available to you. The first step towards this is for every transit agency in the greater Houston area to make all of its data available for the other agencies to use. Routes, schedules, fares, alerts, outages, whatever else – put it into a standard format that can be shared and used by applications. The city of Houston has done a lot of work to make its data available, so there’s an example to follow. Metro undoubtedly has the most data to make available, and likely also has the most IT resources at its disposal, so they ought to take the lead on this. Once the data has been made available to all, the next step is to thoroughly review it, to see what obvious holes exist and what simple things – relocating a station, adjusting a schedule, and so forth – can be done to fix them. See Raj Mankad’s story of taking transit from Houston to Galveston for an example of what I’m talking about. Now it’s time to build all that data into an app so that people can plan their trips. And as long as that is being done, there may as well be a parallel effort to allow for payment from within the app. Metro is already developing a smartphone payment system, so this shouldn’t be a stretch. The bonus here would be for the app to allow for payment on any system. Along those same lines, Metro Q-cards should be accepted as payment on any other regional system, with a reciprocal agreement in place as well. (*) I know there are reasons why so many different transit systems exist in our region. All I’m saying is that if we really want a regional transportation solution, as Metro appears to want, then we need those differences to be made transparent to riders. So that’s the goal, and the path to meeting it. I think about this on the days when I take the bus home, because the stop where I pick up the 85 is also a pickup point for various Woodlands buses. I don’t have a need to go to the Woodlands, but if I ever did I shouldn’t have to figure out on my own what I need to do to get there. If Metro and its peer agencies get this done, I wouldn’t have to. 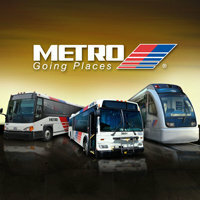 Finally, any discussion of expansion needs to include the fact that Metro doesn’t currently operate in Fort Bend County. That becomes an issue if and when the promised US 90A commuter rail extension – you know, the one that our buddy John Culberson made some promises last year to help get moving – gets funding. That line makes a lot more sense if it can be extended into Fort Bend, but that can really only happen if Metro operates in Fort Bend. For that to happen will take legislative action, and possibly a local referendum; I’m a bit unclear on the exact details. The legislative part I am sure of, and we know how dicey that can be, and how long you have to wait for a second crack at it if at first you don’t succeed. Getting started on that sooner rather than later is probably the better way to go. (*) – When you think about it, why shouldn’t Metro’s Q-cards work on Via and DART and every other transit agency in the state? The EZ Pass we bought from HCTRA pays for tolls anywhere in the state. Why shouldn’t this also be the case for transit agencies? I’m just saying.